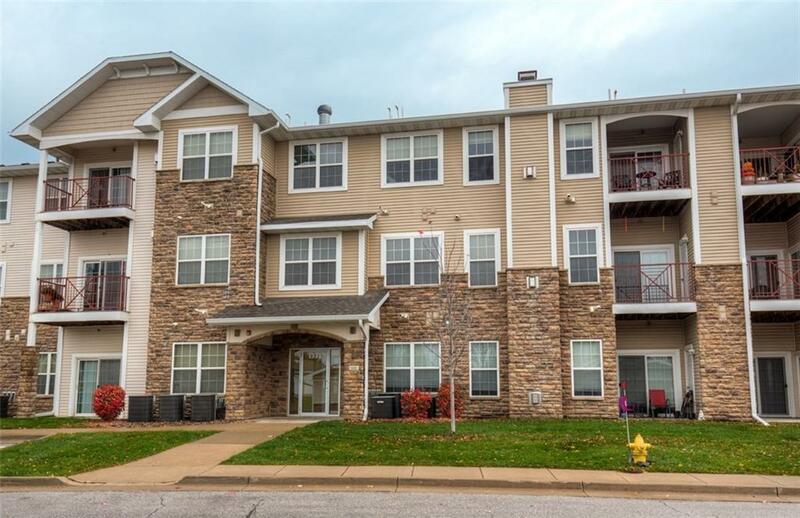 Well-maintained 3 bedroom, 2 bath condo on 2nd floor. Open concept kitchen/dining/living area. Kitchen contains new flooring, eat at bar, pantry, and plenty of counter space. Laundry room right off kitchen. Living room has lots of natural light and a gas fireplace. Access to balcony from living room. Spacious master bedroom with access to balcony as well. Master en suite w/ very large walk in closet! Split floor plan with additional two bedrooms and full bath. Relax and enjoy sitting on your covered patio where you also have access to an additional outdoor storage closet with shelving. Convenient indoor parking - 1 car attached garage. New flooring in kitchen, dining area, and laundry room in 2017. Building has an elevator! Williams Pointe Association features a pool, 24 hour fitness center, community center, and secured building. Waukee Schools.